11th Street Bridge Park, Washington D.C. The 11th Street Bridge park will replace the old 11th Street river bridges. Image courtesy of OMA +OLIN. The Bridge Park will feature an environmental education centre. Image courtesy of OMA. The springboard-sloped ramps will provide visitors maximum look out points to the landmark from either direction. Image courtesy of OMA+OLIN. 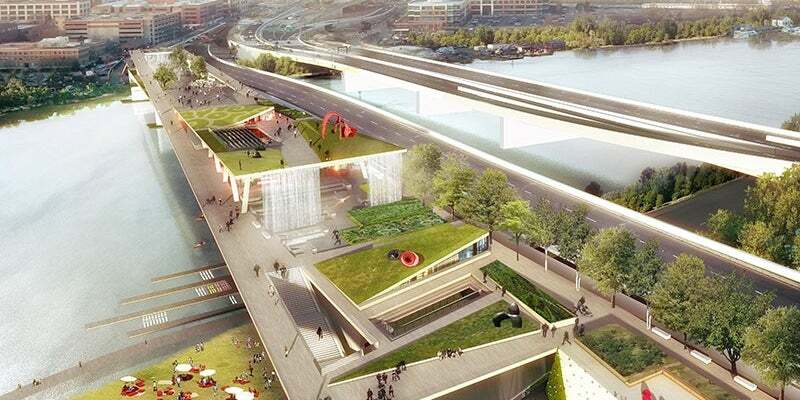 The city of Washington DC, US, will soon get its first elevated park with the construction of the 11th Street Bridge Park. The park is being constructed on three river bridges that connect DC’s Capitol Hill and the historic Anacostia neighbourhoods. The project will replace the old 11th Street river bridges and provide a new location for healthy recreation, environmental education and the arts. Construction on the $45m Bridge Park began in 2014 and is expected to be completed by 2018. It is being built by the Town Hall Education Arts Recreation Campus (THEARC), which is run by a non-profit organisation named Building Bridges Across the River, in collaboration with the city government. The design of the 11th Street Bridge Park was selected from a number of envisioned proposals through a six-month design competition that was launched in March 2014. OMA+ OLIN was announced as the winning design team from more than 80 entries. "Construction on the $45m Bridge Park began in 2014 and is expected to be completed by 2018." The design envisages the park to span the Anacostia river and constructed on top of the piers, which once supported the old bridge. The three concrete piers will now be converted into layered programmes to create the recreational park. The park will spread across an area of 50,000ft² (4,645m²). The park will connect the two sides across the Anacostia river through paths, which will serve as springboard-sloped ramps creating maximum look-out points to landmarks from either direction. A meeting place will be created at the point of intersection of the two paths that will provide a venue for hosting markets, festivals and theatrical performances. Paths from either side will terminate in a waterfall and reconnect to the river system. The waterfall on the east side is connected to a filtration system that will work to clean the river around the crossing. The Anacostia paths are expected to join, forming a loop, while embracing the New York side and linking the opposite banks. The park will form a sloping X-shape due to the intersection of the paths. With Washington Navy yard on one side and National Park Service’s Anacostia Park on the other side, the park will serve varied purposes. It will be a centre of attraction for tourists while also offering a route for pedestrians and bicycle riders. The park will comprise a multipurpose performance space that could be used as required varying from theatre to concerts and from weekend lunch spot to a catalyst for bringing people together. The park will feature an environmental education centre, where school children can learn about the region’s river systems, and the flora and fauna. To engage the entire family, the park will include a play space. It will also have an urban landscape that will serve as a backdrop for planting festivals, farmer markets and healthy cooking classes. The Bridge Park will serve as a platform for public art varying from temporary to permanent artworks. It will also offer interactive art to showcase the rich history of the river, region and the residents. Acting as a recreational centre, the park will launch canoeing, kayaking and paddleboat services, allowing visitors to explore man-made structures such as the USS Barry, Nationals Ballpark and the new Yards Park. The park will also include cafés, restaurants and support facilities such as restrooms, drinking water, storage and maintenance. The estimated cost of the project is $45m, which includes the cost of construction, designing fee, and cost of ongoing operations and maintenance. The DC government has funded $14.5m, while $1m has been provided by a pre-capital campaign from public and private donors. A fundraising campaign was launched after the selection of final design to procure the remaining funds. Olin will also be the landscape architect for the project. ETM associates are responsible for open space programming, maintenance and operations, while Dharam constructing is the cost consultant and Arup will be the structural engineer.